The story takes place in the sky world called Orelus. It begins at the prologue, a world being consumed by war and the skies turning to the purple color of sadness following the downfall of the Kingdom of Kahna. The Kingdom of Kahna gets conquered by the Granbelos Empire, headed by Emperor Sauzer, taking Princess Yoyo captive and forcing the defenders of the kingdom to withdraw in defeat. After the prologue, the horrible war has come to an end with the Granbelos Empire victorious over all the Lagoons of Orelus. Chapter 1 begins, with the rebel alliance called The Resistance, headed by Byuu, with backup from the former captain of the Kahna's Royal Guard, Matelite, and Sendak, magician and wise man from Kahna, being shaped up with the help of many other heroes from around the other kingdoms (Lagoons) also conquered by the empire, notably the great warrior Taicho from the kingdom of Mahal and his allies among others. As their first act they reclaim the former flagship from the Kahna Dragon Squad, called the Farnheit (Fahrenheit) and with this vessel, they set out on a journey to liberate the skies of Orelus, Lagoon by Lagoon from the clutches of the Granbelos Empire." 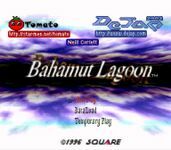 Source: Wikipedia, "Bahamut_Lagoon," available under the CC-BY-SA License.